I haven't posted a nail post in a few days because I had a major fail the other night and my nails have been a mess. I painted my nails with Barry M Indigo in preparation to try the silver Miss Sporty polish I got with stamping (more on that later) but then the baby woke up and had a screaming fit for an hour so the polish got dented and wrinkled and went yukky. I managed to salvage it good enough to stamp over the next day, but then the stamping failed. The Miss Sporty silver isn't as good as the other Miss Sporty polishes for stamping, it's too sheer. 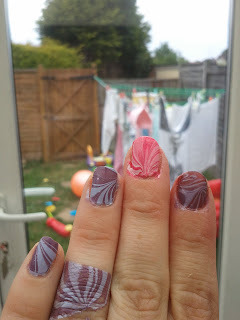 So I used the metallic lilac colour I have from their Clubbing Colours collection, which stamps really well, but because I'd already failed with the silver it turned into a big mess. So now I have naked nails until this evening when I'll do my pink Wednesday mani for tomorrow. 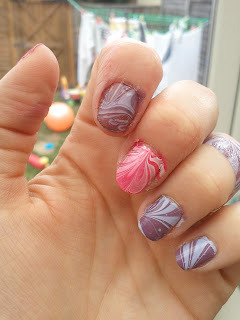 So, in the meantime, I thought I'd show you a relative success I had with watermarbling! I was just playing around and trying a few colours, not doing a full mani, so in these pictures I haven't cleaned up. My other excuse is that I thought you might like to see the perfect, and hilarious, watermarbling effect I got on my fingers by dipping them too far! At first I thought the nail polish on your finger was a ring and that you matched your nail polish to it :P Looks good though.